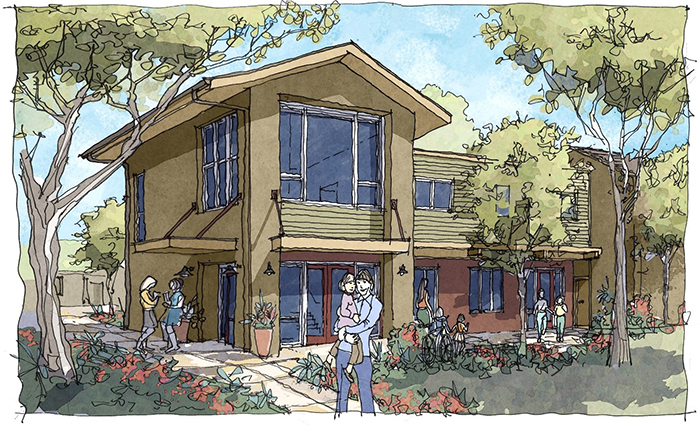 Goleta, July 23, 2015 – Peoples’ Self-Help Housing will break ground Aug. 19 on the $18 million renovation project at the Villa la Esperanza Apartments. Upon completion, 83 units will have been beautifully restored and a new community room constructed in Old Town Goleta. The project budget allocates $12 million for rehabilitation work and $6 million for new construction, design and engineering costs, and other fees. Villa la Esperanza was originally constructed in 1971 under the U.S. Department of Housing and Urban Development’s 236 Program and was owned and operated by the Goleta Valley Housing Committee (GVHC) -- a single-asset non-profit -- prior to PSHHC assuming management and ownership. The Aug. 19 ceremony will recognize the original sponsors and members of the Goleta Valley Housing Committee who were responsible for the construction of the complex in 1970, as well as the final members of the committee at the time of the transfer in 2014. The property currently consists of 75 units, including eight five-bedroom units that were underutilized and don’t meet current needs. As part of the major rehabilitation project, PSHH will convert seven of the five-bedroom units to smaller apartments, increasing the total number of units to 83. PSHH will also be constructing a new 5,000 square foot, two-story community building that will include a Youth Learning Center, community room, community kitchen, laundry facilities, two tot lots, playground and barbecue area. It will additionally feature office space for a manager, assistant manager and resident services coordinator. PSHH President/CEO John Fowler will discuss the rehabilitation project and how the donation of the Villa la Esperanza property will be leveraged through creative financing and tax credits investments to generate funding opportunities for the development of 250+ additional affordable housing units in the greater Santa Barbara area. Other speakers will include a representative from the office of Santa Barbara County Supervisor Janet Wolf, Santa Barbara County Supervisor Salud Carbajal, and City of Goleta Mayor Paula Perotte. Partners include RMM Design Group Architects, Robert Fowler Landscape Architect, and Stantec Inc. Civil Engineers, as well as tax credit equity investor Merritt Community Capital Corporation and construction and permanent lender CITI Community Capital. The event is free and open to the public. Tours of the property and a light lunch by The Fig Grill of Goleta will be provided after the program. The Goleta Valley Chamber of Commerce will assist with the official ribbon cutting.